Hugger Mugger's Diane Donahue, left, and Jill Zechmeister, marketing director of the Midwest Yoga Conference, in the spring of 2007. A yogi starts making yoga gear for her own practice. Soon, her friends are asking, "Hey, where did you get that?" This is how the yoga supplies company Hugger Mugger began. Two key products, inspired by comments and suggestions from other yogis, added to the success of the venture: a pair of shorts that didn't ride up during poses, now known as Hugger Mugger Shorts, and a textured yoga mat called the Tapas Sticky Mat. After 20 years, Hugger Mugger still listens to the recommendations of other yogis to develop yoga gear for any level of practice. LoveToKnow Yoga asked Diane Donahue, marketing director for Hugger Mugger, to share the company's philosophy. So, a special pair of shorts opened the door of commerce? Yes. Teachers and students would say, "Hey, I need a pair of shorts that doesn't slip down to my hip creases and show my underwear when in headstand or shoulder stand." The founder, Sara Chambers, developed Hugger Mugger Shorts. Today, we still listen to the yogis: their wants, needs, and missing items. What do you look for most in a vendor of the products not made by Hugger Mugger? As a buyer, it's always a challenge to find items that are unique and never seen before! Especially in this day and age of the Internet. You can search in any country, anytime. There are guidelines that we have been using for many years that help in selection, such as fair labor practices, created by a yogi with intention, and eco-friendly. But the bottom line is: It would be a product that you would find in a yoga studio, a product that aligns with yoga and its teachings. Does the company "test drive" yoga gear before selling it? Yes! We have yoga instructors that will test products for us. We really value the relationships with the teachers and studios that have evolved over the 22 years! The mat that started it all - the Tapas Sticky Mat. Do yogis provide feedback as to how well something works or how it actually performs in practice, and if so, how much value does the company put into that input? Yes, oh yes! We totally listen with all our awareness! The teachers and students are the biggest testimonials we could ever hope for. They are invaluable to the company. We are so lucky to have them e-mailing and writing their thoughts to us. 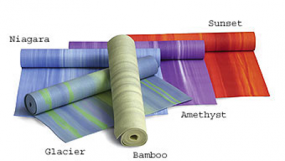 The company uses materials such as bamboo and cork for yoga blocks, and natural fibers for yoga bags. Why is the use of sustainable materials important, and how do customers respond to those products? There are so many articles from the scientific community and from the environmental community that I could refer to here about the benefits of sustainable materials. However, the most straightforward answer from the principles of yoga would be ahimsa, which means non-injury or non-violence. This applies to every living thing: plants, animals, and humans. Customers love the sustainable products. We can't keep them in stock. Conscientious consumers are very quickly becoming the "mainstream." There is definitely an awareness in yoga studios to offer "green" products in their retail mix and to have as yoga gear in the studio. It is slowly but surely trickling into other yoga markets as well: fitness/gyms, college, and gift stores. We have such a wonderful selection of sustainable products and we are working with other sustainable materials as well, some that will be new to yogis! Does Hugger Mugger have any fun and innovative yoga gear we can look forward to using soon? A wonderful prop bag, which can hold your mat, blocks, strap, blanket, and clothing. Some fun, new colors of Tapas Sticky Mats. A really exciting eco mat! It is so exciting and top secret, you'll have to wait until fall, 2007 to see it! It will really be an innovative introduction of a new mat product.